Then we journeyed downtown to Knit Purl on SW Alder and 11th. This stop was a must because Knit Purl is one of the few stores around the nation to carry Brooklyn Tweed SHELTER. I've been a longtime fan of Jared Flood of Brooklyn Tweed - his designs are classic and beautiful, and his photography is just wonderful! - and when I found out BT was coming out with its own line of worsted wool, I was absolutely interested. However, I wanted to see it in person before I bought it (even though I bought a shade card, I still want to hold the skeins in my hand, you know? ), so this was my first opportunity to do so, and it did NOT disappoint. I bought two skeins in Thistle (pictured left) to make BT's Romney Kerchief. I also bought from Knit Purl a skein of Shibui Knits Silk Cloud in Graphite, this stunning laceweight mohair/silk yarn, perfect for floaty lace things :) None of my local area stores carry Shibui Knits, and I've been wanting lately to make something floaty-lace and fuzzy, so I bought one skein to make Churchmouse's Mohair Bias Loop, because there was one knit from Silk Cloud in the store, and I thought it would be nice and versatile. I know it sounds weird to be excited about going yarn shopping, but if you've never been to a yarn store (a REAL, local yarn store, not Michaels or Joann's! ), you're missing out! (Even if you don't knit or crochet!) 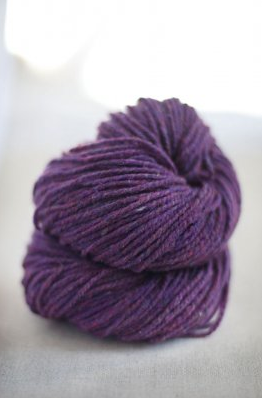 It is an absolutely lovely experience for your senses - the range of colorways you'll find are stunning, and it actually is sooooo nice to walk around and fondle the yarn (which you're encouraged to do!) I'm glad I finally got a chance to hit up a couple of Portland's best LYSes this time around.